There are so many gorgeous patterned papers on the market now. Many of them are a work of art in themselves and it seems a shame to cover them up with photos. When this happens, quite often, less is more. By taking just a portion of the patterned paper, it is easier to draw attention to it without detracting from your photo/s. This layout demonstrates this principle. By only using half of the patterned paper and reflecting it's design in small elements like the title, the viewer is able to enjoy its beauty while still taking in the photo. Try adapting this technique to your favourite papers. You are sure to love the results! This layout was created using Sassafras Lass Dreamy Crush Paper, pale yellow and olive green Bazzil cardstock, brown ink, brown pen, green twill and alphabet stamps. Begin by preparing your background. To do this, use your brown pen to draw a border around your pale yellow Bazzil cardstock. If you are not confident in doing this, use a ruler to guide you and first practice on the right side of your page (this will later be covered up). Don't worry about making the corners neat as they will also be covered later. Now take your Sassafras Lass Dreamy Crush Paper and tear down the right side of the page so you end up with an outline of the floral pattern. Wet along the edges of your tear and curl the paper. You might find curling it around a toothpick makes it easier for you to get a nice curl. When you have finished, set it aside to dry. Also cut two corners from your remaining Sassafras Lass Dreamy Crush Paper, making sure the stripes will end up horizontal. Tear down the diagonal. Once again, wet the edges of the tear and curl up. Set aside to dry. Mat your photo on olive green Bazzil cardstock and position towards the top left of your page, keeping in mind where your patterned paper will be added. Adhere in place. 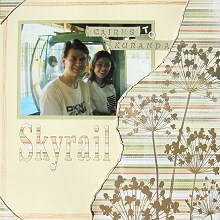 Cut two pieces of green twill and stamp one word of your title on each (in this case, Cairns and Kuranda). Adhere to the top right of your photo, as shown in the layout above. If you need a connecting word (such as to), cut this from your Sassafras Lass Dreamy Crush Paper or use small alphabet stickers. Everything should now be dry. Using brown ink, lightly ink along each curled edge to give extra dimension. Again, set aside to dry. Cut the remaining word/s of your title from remaining Sassafras Lass Dreamy Crush Paper and ink the edges with brown ink. When dry, adhere below your photo. Finally, adhere your patterned paper down the right hand side of your page so that it overlaps slightly with your photo. Also, adhere your corners in the top and bottom left corners of your cardstock.